Marquez Crater - According to the Earth Impact Database, the Marquez Crater is a 58 million year old 12.7 km structure preserved in sedimentary rock. Though the crater is almost completely buried. Some impacted rocks within the central uplift, which was known as the Marquez Dome prior to recognition as a crater, are exposed at the surface, however, and shattercones have been found in this material. The vetical offset of the central uplift is in excess of 1200 meters (Sharpton, 1990). Resource exploration in the area has produced numerous drilling records, which have been integrated with other avenues of investigation. Dietz, R. S., McHone, J. F., Astroblemes recently confirmed with shatter cones (abstract). Meteoritics, v. 26, p. 332. 1991. Sharpton, V. L., Gibson, J. W., The Marquez Dome impact structure, Leon County, Texas (abstract). Lunar and Planetary Science XXI, pp. 1136-1137. 1990. Other significant evidence: breccia, seismic reflectance and drill core data, Bouguer gravity anomaly mapping. Marquez crater is located in the northwest corner of Leon County, in East Texas (Sharpton, 1990). The mixed sedimentary target rocks are late Triassic or more recent. (Wong et al., 1993) Sharpton, 1990, notes Cretaceous to Eocene. Buthman, D. B. (2000) 3D Seismic Investigation of Marquez Dome, East Texas﻿ (abstract). Abstracts of the 31st Lunar and Planetary Science Conference. Gibson J. W., Jr. (1990) Marquez Dome - An Impact Feature in Leon County, Texas. M.Sc. thesis, University of Houston, Texas, USA. 65 pp. Grieve, R. A. F., Masaitis, V. L. (1994) The economic potential of terrestrial impact craters. International Geology Review, v. 36, pp. 105-151. McHone, J. F., Sorkhabi, R. B. (1994) Apatite fission-track age of Marquez Dome impact structure, Texas (abstract). Abstracts of the 25th Lunar and Planetary Science Conference, pp. 881-882. Niquette T. and Norris M. (1983) Evaluation of a structurally disturbed portion of Wilcox lignite trend (abstract). American Association of Petroleum Geologists Bulletin 67, 525-526. Reimold, W. U. and Dressler, B. O. (1990) The economic significance of impact processes (abstract). Abstracts for the International Workshop on Meteorite Impact on the Early Earth, Perth, Australia, pp. 36-37. Herrick R. R. and Sharpton, V. L. (1997) Shallow Seismic Test at Marquez Impact Structure (abstract), Abstracts of the 28th Lunar and Planetary Science Conference. Sharpton, V. L., Gibson, J. W. (1990) The Marquez Dome impact structure, Leon County, Texas (abstract). Abstracts of the 21st Lunar and Planetary Science Conference, pp. 1136-1137. Westbroek, H. and Stewart, R. (1996) The formation, morphology, and economic potential of meteorite impact craters, CREWES Research Report v. 8, page 34-6. Wong, A. M., Reid, A. M., Hall, S. A., Sharpton, V. L. (2001) Reconstruction of the Subsurface Structure of the Marquez Impact Crater in Leon County, Texas, Based on Well-Log and Gravty Data, Meteoritics vol 36, No. 11. Wong, A. M., Reid, A. M., Hall, S. A., and Sharpton V. L. (1993) Characterization of the Marquez Dome buried impact carter using gravity and magnetic data (abstract). Lunar and Planetary Science XXIV, pp. 1533-1534. Wong, A. M., Reid, A. M., Hall, S. A. and Sharpton, V. L. (1994) The subsurface character of the Marquez impact crater in Leon County, Texas, as determined from gravity and well-log data (abstract). Abstracts of the 1994 Meteoritical Society Annual Meeting, Meteoritics, v. 29, pp. 552-553. 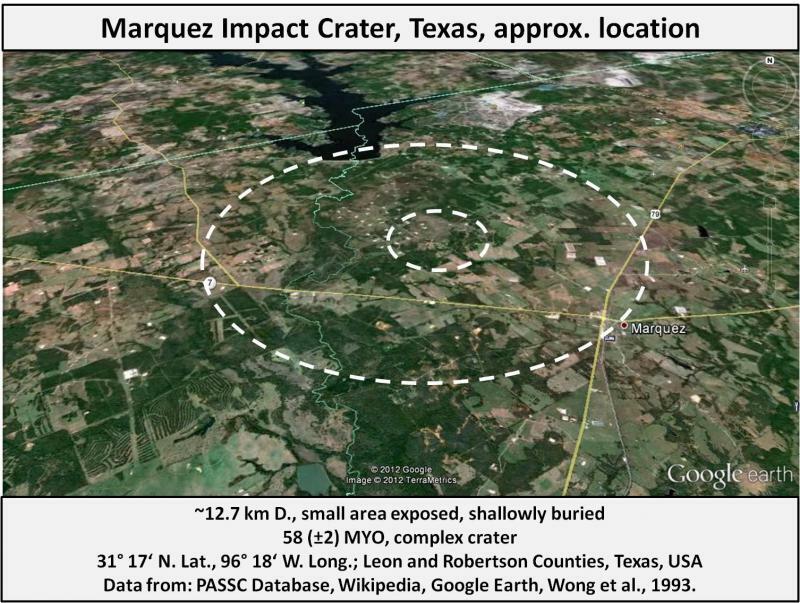 Wong, A. C., Sadow, J. C., Reid, A. M., Hall, S. A. and Sharpton, V. L. (1997) The Marquez crater in Leon County, Texas. in Ames Structure in Northwest Oklahoma and Similar Features: Origin and Petroleum Production (1995 Symposium), K. S. Johnson and Campbell J. A., eds., Oklahoma Geological Survey, Norman, Oklahoma, v. Circular 100, p. 278.